The key to making sense of the adolescent is to understand the developmental dynamics at play as well as the attachment needs of the adolescent. These needs are typically underestimated due to the physical maturity of adolescents and the resistance to dependence that can result from becoming prematurely attached to peers. Adding to the confusion is the fact that there is more than one developmental pathway to adulthood and societal integration. Adolescence literally means ‘growing into maturity’. An adolescent is neither child nor adult and therein lies much of the difficulty, the turbulence, the confusion and the challenge. They need us, yet need to not need us. We are their best bet, yet their instincts are to resist us. Unlike primitive cultures, our highly complex society requires a lengthy adolescence with very few rites of passage. The task of turning children into adults has never been more daunting! Nature’s part in creating grown-ups is to equip them for adult functioning around the time of puberty, ready or not. These changes create their own rites of passage that the adolescent must negotiate to truly mature. Unfortunately, growing up is not a given; not all adolescents embrace their developmental destiny. The most common temptation of adolescence is to replace parents with peers instead of becoming one’s own person. The most common mistake of adults is to back off prematurely. As long as an adolescent is not yet viable as a separate being, he or she is meant to be attached to those responsible for him or her. These rites of passage create challenges for parents and teachers as well: the adolescent’s new found idealism makes them critical of us; their developmental self-absorption makes them deaf to our perspective; their acute allergy to coercion makes them rather difficult to direct. Our challenge as adults is to help our teens cross the bridge from childhood to adulthood, to encourage them to embrace their developmental destiny and to ultimately shoehorn them into adult society. Meanwhile, we have the day-to-day challenge of parenting and teaching them, of guiding and directing them, of shielding them from stress. Adolescence is truly the womb of adulthood and those enveloped in supportive adult relationships have the greatest chance of successfully negotiating this tumultuous time. The challenge is not to treat them as if they were children nor to retreat from them as if they were adults. Learning to ‘dance’ with an adolescent commands the very best in us. The course material is organized around three psychological changes that occur during adolescence, the seven rites of passage that these changes create, the resulting temptations for the teen, and the corresponding challenges for those who parent, teach or work with adolescents. Complicating adolescence is the fact that there is not one, but rather two developmental pathways to adulthood. Knowing which track the adolescent is on is key to knowing how to help facilitate his or her passage into adulthood. 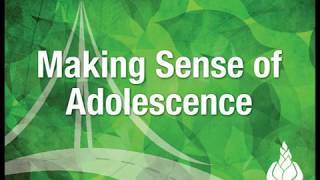 The objective of this course is to make sense of adolescents from inside out. Every adolescent is an individual of course, but there are some common dynamics that affect all adolescents. Understanding what these dynamics are can provide the keys for knowing how to deal with the problems that may arise. The tuition fee for taking Making Sense of Adolescence through continuing education is $200. This includes a virtual campus student pass of four months to access the videocourse material as well as other supporting materials. If a personal copy of the DVD set is desired, the tuition fee is $275. Neufeld Institute Faculty member Tamara Strijack is the coordinator for this course. She is also the director of our continuing education program and an experienced university instructor. For questions regarding this course, please contact the course registrar.